Dr. Santore is a Harvard University-trained Orthopaedic Surgeon with Fellowships in Total Hip, Total Knee and Osteotomy surgery from Harvard University and AO of Switzerland. He served as Chief Resident of Orthopaedic Surgery of the Massachusetts General Hospital. He has been affiliated continuously, since completion of post-graduate and fellowship training, with the Orthopaedic Medical Group of San Diego. He is a graduate of the University of Pennsylvania School of Medicine, the first medical school to train doctors in the United States. 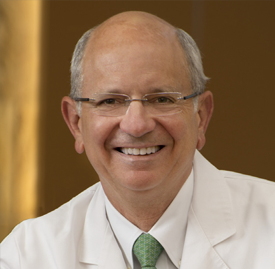 He is one of the world’s leading experts in the field of osteotomy and joint-preserving surgery of the hip and knee and an expert in Total Hip and Total Knee surgery. Dr. Santore is the Chief of Staff-Elect of Sharp Memorial Hospital, San Diego and a Clinical Professor of Orthopaedic Surgery at the University of California, San Diego (UCSD). He has served as President of the American Association of Hip and Knee Surgeons, President of the California Orthopaedic Association, President of the Western Orthopaedic Association, President of the San Diego Surgical Society, Division Chief of Adult Reconstruction of UCSD, Chairman of Orthopaedic Surgery of Sharp Memorial Hospital and President of the San Diego Chapter of the Western Orthopaedic Association. His is the co-director of the San Diego Fellowship in Adult Reconstruction Surgery. He is a respected expert in personal injury matters pertaining to the hip and knee. He has been an invited speaker and/or visiting Professor at hundreds of meetings all over the world, including Switzerland, Italy, Germany, Austria, China, South Korea, Canada, Mexico, Columbia, Chile, Argentina, Japan, Micronesia, Australia, and India. He budgets time for approximately 30 domestic and international speaking engagements a year. In 2007, he was asked to be the local co-chairman of the annual meeting of the American Orthopaedic Association, which was held in San Diego for the first time. The other co-chair was his long-time friend and OMG partner, Dr. Richard Coutts.